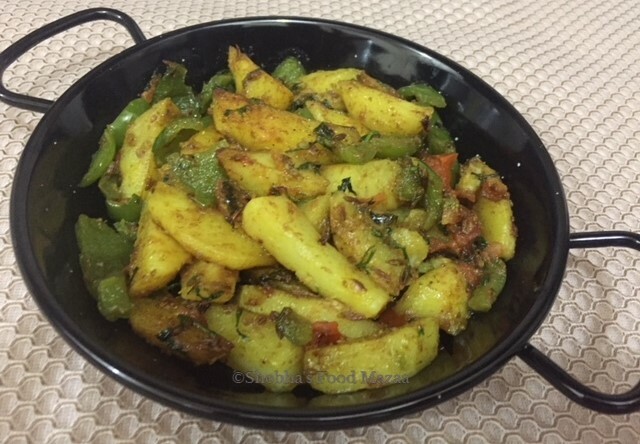 This is a very simple sabzi of aloo and capsicum with bare minimum masalas. It is our family favourite. You can enjoy this with rotis and puris. 1. Slice the potatoes, rub a little salt and deep fry till done. 3. In a pan heat a little oil and add cumin seeds, cinnamon and asafoetida. 4. Put the sliced capsicums, a little salt and stir fry for a minute. Add the tomato slices and simmer for a minute again. 5. Now put the fried potatoes, turmeric and cumin powders. Mix well. Serve with puris or rotis. Yes Nithu..potato curry is my all time favourite too. That's really cool.. Enjoy your cooking and eating sessions. I love potatoes.. They are so versatile.. Also according to me they make a perfect side dish for Indian flat breads.. Love this capsicum and potato combo.. Yum! this is my favorite go to dish, when nothing in fridge , make this one. This is our family favourite too Nayna.